(C. melo) A round early sweet productive cucumber-melon with dark green skin with blotching and light longitudinal furrows. Fruit skin is crisp with a white interior revealing a savory tender flesh that is bitter-free and does not cause indigestion as other cucumbers can. Growth habit is slightly bushy, with fruit setting about 1-2 feet down the stem. Seed packet includes 24 seeds and growing instructions. 24 Seeds. To learn more about this variety, see my blog post. 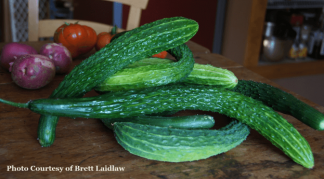 CucumberShop © 2019 ~ Burpless Rare Heirloom Carosello and other Cucumber Seeds for $2.50 ~ Free shipping.